Firearms History, Technology & Development: What is the Bore/Gauge of a Weapon? In the medieval period, the inner diameter of a barrel was frequently referred to as the bore (or gauge) of the weapon, and different weapons were classified by their bore size. This designation still exists in the present day, when referring to shotguns (e.g. 8 bore, 10 bore, 12 gauge etc.) while most other weapons are classed in mm. or inches (for instance, 9 mm., .45 caliber etc.). So what is a bore/gauge and how is it measured. To study that topic, we must go back to a time when bullets were cast round lead balls. The bore or gauge was determined from the weight of a solid ball of lead that could fit into the barrel. For instance, if a spherical ball weighing 1/10th of a pound could fit into the barrel, then the gun was considered to be 10 bore (or 10 gauge). If a ball weighing 1/12th of a pound could fit into the barrel, then it was 12 bore (or 12 gauge) and so on. Conversely, if you had 1 pound of lead available, you could cast 12 bullets for a 12 bore (or 12 gauge) gun and 10 bullets for a 10 bore (or 10 gauge) gun and so on. Even though bullets were no longer spherical shaped, this unit continued to be used into the 19th century to denote the barrel diameter, assuming that a spherical ball of lead was used. As you might have gathered from the paragraph above, the smaller the bore number, the larger the diameter of the barrel. Therefore, a 4 bore gun would have a large diameter, since 1 pound of lead would only make 4 solid spherical bullets for this gun. As you might have guessed, 4 bore guns were called "Elephant Guns" and used to shoot large animals like elephants, buffaloes and rhinos. In the picture above, we have 3 cartridges, left to right: a .30-06, an eight bore and a four bore cartridge. Note that the .30-06 is the cartridge used by the M1 Garand rifle and measures 7.62 x 63 mm. 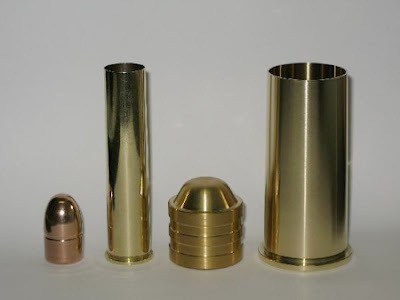 This gives the reader an idea of the size of one of these large bore bullets. By the way, the four bore wasn't the largest elephant gun around. There was also the two bore. The two bore was only used by very few men because of its immense recoil and weight. Among other weapons, I had an extraordinary rifle that carried a half-pound percussion shell; this instrument of torture to the hunter was not sufficiently heavy for the weight of the projectile: it only weighted twenty pounds, thus with a charge of ten drachms [270 grains] of powder and a HALF-POUND shell, the recoil was so terrific, that I spun around like a weathercock in a hurricane. I really dreaded my own rifle, although I have been accustomed to heavy charges of powder and severe recoils for some years. None of my men could fire it, and it was looked upon as a species of awe, and it was name "Jenna-El-Mootfah" (Child of a Cannon) by the Arabs, which being a far too long of a name for practice, I christened it the "Baby", and the scream of this "Baby" loaded with a half-pound shell was always fatal. It was too severe, and I seldom fired it, but it is a curious fact that I never shot a fire with that rifle without bagging. The entire practice, during several years, was confined to about twenty shots. I was afraid to use it, but now and then as it was absolutely necessary, it was cleaned after months of staying loaded. On such occasions my men had the gratification of firing it, and the explosion was always accompanied by two men falling on their backs (one having propped up the shooter) and the "Baby" flying some yards behind them. This rifle was made by Holland & Holland, of Bond Street, and I could highly recommend it for the Goliath of Gath, but not for the men of A.D. 1866. The two bore was the largest rifle that could be fired from the shoulder. There are still larger calibers though. One of these examples is the 1 bore or punt gun, which was designed to be fired from a boat. We will discuss punt guns in a future post.